I would estimate that half of Nashville restaurants have no carry signs. I am curious how they can afford to turn away a substantial portion of potential customers, both those who carry and those in the same group with them? Is business so good that 15% or so of potential business can be just driven away for ideology? Some of the signs aren’t pictograms but rather coy text plaques along the lines of “we respect the rights of gun owners, but you aren’t welcome here.” Even if postings were not enforceable by law (which they are in TN), I wouldn’t give my business and money to bigots. I have contacted a few restaurants with emails and photos of receipts from their competitors, but they don’t seem very concerned. I am curious why. I doubt that many people pick eateries on the strength of seeing a carry prohibition, while the reverse is pretty common. This entry was posted in advice requested, rkba. Bookmark the permalink. Most gun-haters are leftists, and leftists view their ideology the way that the religious view their faith: they simply will *not* change their views as a result of negative feedback, since they can then claim victim/martyr status. Are you saying that a willingness to change as a result of negative feedback is a virtue? Well I suppose it depends on the nature of the negative feedback. Having my finger in a light socket energized with 120 VAC would result in “negative feedback” (reality, in this case). In that case I’d change the position of my finger. People calling me names for believing what I believe would only reveal to me that some people are dumb and mean, but wouldn’t budge my beliefs. I already know that some people are dumb and mean, so having it demonstrated once again will not change anything. Do you think you might change your belief in liberty if enough Progressives call you enough derogatory names, and that such a change would demonstrate a strength on your part? SADLY I suspect that these “Anti” establishments KNOW that a majority of gun owners, Fudds, and even staunch 2A advocates will NOT have the intestinal fortitude to alter their spending habits because of their beliefs. It is one thing to rant and rave on the internet about the injustice of our rights being taken away BUT another completely to back up our words with actions. Remember, only a small % of Colonists were actively seeking independence form England http://www.ushistory.org/us/11b.asp MOST were considered “Fence Sitters”. Allowing others to fight the “good fight” for us will never be enough. If we do not become politically active AND speak with our dollars….NOTHING will happen. The Anti’s know this – do we? KUDO’s for the following: “I have contacted a few restaurants with emails and photos of receipts from their competitors, but they don’t seem very concerned”. But if you are the only one in a given week who does this….we lose. And I sadly suspect that you are pretty much alone in your activism. I suspect that the patrons with a CCW that dine at these establishments are still carrying their firearms. Cork above is correct for one. Same with politics. Most people won’t make changes and don’t even get why I do. I don’t eat places that ban guns, I don’t read books by Scalzi, etc. 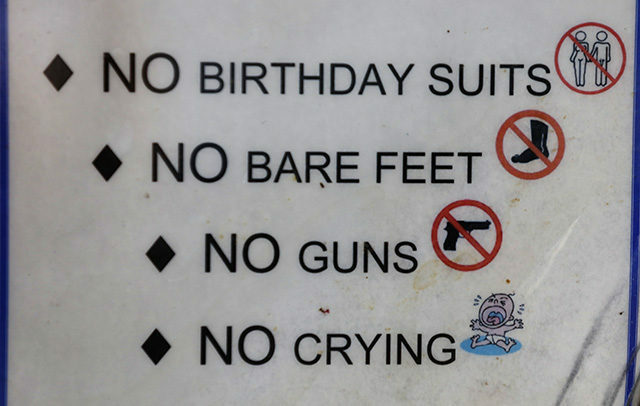 Secondly in Texas, at least, the sign has the same legal authority no crying does. None. So some places use it to play both sides and this was publicly admitted by people. Kinda sleazy but heck, I long ago stop expecting honourable behavior. I have seen places in small towns go out of business for posting. When CCW first came in, I watched one cafe in Euless post and they were empty the next day and out of business the next month. Same in Denton, which is turned into a smaller version of Austin. Open carry is a different matter. We are now seeing lots of no open carry signs, sometimes with a “concealed carry welcome” nearby. Open carry is considered more situational than concealed – the park at night walking your dog is good but a nice restaurant not so much – and even a lot of LTC holders think it’s a dumb idea. Why telegraph? Some of it is also in reaction to some of the insanity on the OC supporters side. In Minnesota the prohibition carries the same legal penalty as a parking ticket with no additional consequences short of a $25 fine. Cops can’t seize your gun, you can’t be hit with a trespassing citation, nothing. So mostly people in Minnesota ignore them. For the last seven years I’ve taught permit to carry classes at the Carpenter’s Union Regional Council offices, plainly marked no guns with the appropriate signage, the Carpenter’s Union Pheasants Forever chapter routinely holds events here and raffles off guns, no one cares. Oleg, most boycotting of restaurants over this issue doesn’t make a difference to there bottom line. They typically don’t work at stores either. I have a friend who actually made s monetary impression on a Burger King to force those signs to come down. You will have to be creative to make your point at a normal restaurant. I can also tell you how to do it to a store as well. I’m with you. If they don’t want my gun, They don’t want my money. Instead of talking boycott, you might talk liability. If you make your place of business a defenseless victim zone — a place attractive to criminals and terrorists — be prepared to face a liability lawsuit if anyone gets injured in your shop by armed lawbreakers. That too might not actually work out in the long run (depending on state laws, which are probably not helpful for such suits) but just the threat might be helpful. Instead of talking boycott, you might talk liability. And, depending on where you live, perhaps the person to talk to isn’t the restaurant owner, but your state legislator. This. There needs to be serious legal liability for declaring a “gun-free” zone without providing actual physical security. Secondly in Texas, at least, the sign has the same legal authority no crying does. None. Violation is a Class C Misdemeanor, $500 fine. Refusal to leave is a Class A Misdemeanor, $4,000 fine, a year in jail, and you lose your license to carry for seven years. I remind owners that these aren’t “No Guns” signs. The 30.06 sign prohibits only licensed concealed carry, and the 30.07 sign prohibits only licensed open carry. Neither sign prohibits carrying long guns, law enforcement carry, or carry by unlicensed people including criminals. Across Texas, no-carry signs are rare and concentrated in larger, bluer cities. That’s a $200 fine, not $500. Also, the class C misdemeanor doesn’t have any effect on your CHL and the penalty doesn’t increase for multiple offenses. In other words, the Texas signs don’t apply to rich people. The lesser fine in 30.06/30.07 is indeed $200. The standard Class C Misdemeanor fine is $500. It’s a sign and I hope they mean it. Leave your gun with the bartender. sure cuts own on the would be righteous maniac that thinks he has a Need to use the right bear. This isn’t the wild west although some would have it that way. Their business may be down 15% but so is their liability insurance. They apparently are doing Okay without that suggested drop in business. Go piss on somebody else’s boots and keep you guns to your self. There is nothing like a hail of bullets to put off the less aggressive of their cliental.. No I am not a gun control freak I have them and know how to use them. “use the right bear” — WTH?? “piss on somebody else’s boots and keep you guns to your self.” — WTH?? “nothing like a hail of bullets to put off the less aggressive of their cliental” — WTH again?? Seriously, August, not only do you exhibit the classic “I’m a gun owner but…” mentality, your posting casts serious doubts on your stability. I’m thinking there’s a serious case of projection here. Actually there is a very high probability that the person writing this little screed is a female university student running a troll. The total lack of knowledge pertaining to gun laws (its illegal to take any gun into any bar in all 50 states) The poor spelling and sentence structure, and the perception that gun culture is somehow “macho” all point to a feminist or homosexual author in the 18to25 year old range. Who has been radicalized at one of our university’s , trying to run an anti gun troll. The utter failure to make a cohesive statement speaks volumes for the educational system. Ray, in Tennessee and several other states, carrying at bars is legal. You just can’t be drinking while carrying. As for trying to guess the identity of the author, he’s a perfectly real person. Your guesses as to the identity are not close. In many states you can even drink will carrying. In Minnesota if your BAC is under 0.04% you are legal. Hey, look, Ray’s posting the same like he’s already posted before. No, actually, only a handful of states ban guns in bars. I think it’s literally just five. Leave your gun with the bartender. If there’s a bartender it’s probably a gun-free zone by state law. Like the Pulse nightclub in Orlando. Actually, it probably isn’t. Only a handful of states have such laws. Sadly, Florida was one of them, with tragic result. August, NH does not restrict carrying in bars, or even carrying while intoxicated. Amazingly enough, we don’t have bar shootings. Last incident I can recall is about a decade ago, where someone /outside/ a bar decided to shoot the bouncer, and was instead shot by one of the patrons. So, we’ve had zero negative impact from unrestricted carry in bars, and at least one life saved. Good to know. I would omit “amazingly enough”, given what we know of the very high average level of responsibility of those who exercise their right to concealed carry. “As you should expect” would be more appropriate. I’d just say “right to carry” and omit “concealed,” though. Open carry is common and unremarkable, here. Heck, I was just eating dinner in downtown Manchester (our largest city), and there was someone openly carrying at the counter. I only noticed because he was on the corner, so I had to give him a little extra space to avoid snagging my vest on his pistol. For that matter, I’ve seen someone ordering sandwiches as a Manchester sub shop with a slung FN-FAL. When the signs went up here and there in my small town in AZ when CCW was passed, they only lasted about 2 weeks. Not only did CCW holders stop using those businesses, so did non CCW holders, family members, friends etc. Business dropped so fast they back tracked. Large corporate store fronts took signs down when their HQs were contacted and complaints filed. Only two kind of signs left. Those on dr. offices and those on the gun stores. Gun stores ask that weapons be kept in holsters unless cleared with the action open. Why medical offices? We know that medical establishments are not exempt from violent attack. In fact, they are often targeted by robbers, if they have certain drugs on site. I can’t imagine patronizing a doctor with such a sign. I can’t imagine even seeing such a sign on a doctor’s office. I guess I can understand the gun store signs, if that’s necessary in that area. Never seen it, myself, since “keep it holstered if you’re in a crowded place unless you plan to use it” is just common sense for anyone I’ve met. But if an area does not have a strong gun culture, that may need to be specified. That explains the whole thing. Strange that Nashville has more posted restaurants than Minneapolis! (higher proportion, anyway) I very rarely see a sign, and as somebody mentioned, it’s very often a medical facility or something. Even rarer on general businesses. I suspect that the number of people who aren’t going is so tiny they don’t notice. I suspect a lot of permit holders just count on not getting caught, rather than feeling they need to make a political point. There’s a flavor of libertarian that often has a permit and isn’t terribly interested in trying to influence the behavior of others. Oleg. “No guns in bars” is a FEDERAL law as well as a state law in the several states. If you do it and the US Att. finds out and want a piece of you, you go to jail, no matter what the state says about it. So it does in fact apply in all 50 states and all us territory’s . (go look it up. Its been on the federal books forever) If that is a real person their comment is still nothing but an anti-gun troll. FYI I was trolling them back. I think of it as spraying raid on anti-gun cockroaches. Some wants to insult me, I insult back. If Someone wants to harm me I shoot them. Simple and effective. If I had my way we would bring back dueling. As Robert Heinlein one wrote “Violence or the willingness to use violence, not only solves most problems its the only thing that ever has” he also wrote “An armed society is a polite society”. Your “friend” was rude. I just returned the insult. Not my friend, a stranger. I just happen to know who the stranger is. Do you have the link to that that federal law? Of course he doesn’t. He’s been called on that nonsense multiple times. There is no such law. The card by itself may not help to change the proprietor’s mind but it might be enough to cause another patron to ponder the subject and maybe start a discussion with management themselves. Carry concealed. It is that simple. Oh, and don’t patronize anti-Freedom establishments.